Anneal's Mobile Office Communication Assistant (MOCA-830) extends your SMB/Enterprise communication everywhere in the world. Now your cell phones, IP phones, and soft phones can all register to 3G MOCA and become your office extensions at anytime and at anywhere in the world through the Internet. Calling each other is absolutely FREE, as if everyone is located in one single building. When you are out of the offfice, you can simply register to MOCA-830, and dial back to your office extensions for FREE. Traditional phones can also be supported as a life-line through the PSTN in cases of power outages. 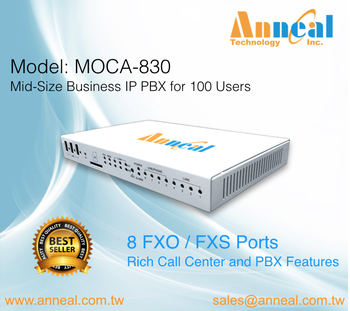 MOCA-830 is a flexible and converged IP PBX system and provides up to 8 FXO/FXS ports. Fax server, printer server, web cam, H.264 video phones, and 3G wireless network modem support are all built-in to conveniently converge voice, video, and data communication in your SMB/Enterprise. It enhances and smoothens internal flow of communication to achieve a higher business productivity. Traditional PABX with state-of-art IP PBX features are combined for PSTN, GSM, WiFi, 3G/3.5G, and ITSP to interoperate with one another. This makes FREE internal calls and low-rate domestic/international calls at all possible for SMB/Enterprises. By using Anneal's MOCA-830, your business can experience a higher return on investment and lower communication expenses significantly. Anneal's MOCA Series can help you experience a unified communication within your office with a variety of calling features such as, Auto Attendant, Conference, Ring Group, IVR, Call Recording, Call Transfer, Call Parking, Call Forward, etc. You won't have to worry about missing any more important phone calls. Your own extension can easily be set on "Follow Me" mode, so every single call can be conveniently routed to your mobile phone. By utilizing this calling feature, your business will less likely miss any more key sales opportunities, resulting in a boost in overall productivity and maximization in profit.